After having massive issues with mine remote central locking, and tried to determine what is wrong and how i found a solution for it. When i got my car my remote key was not working, after having it for a while i sat down to figure out what is wrong. My central locking worked fine with my key in the driver side door and my comfort features such as coming home, open / close power windows, fold / unfold side mirrors all worked fine. First of all we need to establish where the issue is, as it looks it can be either the CCM or the key itself, to eliminate the "obvious" part take your key apart. Notice: when taking your key apart it´s a good idea to have a flat head screwdriver that fits in the slot for the "break-open" part on your key, smaller screw-drivers will leave marks and over time damage the opening so in future it will not close/seal properly. Once its in two peaces you can break off the "button / bottom" end of it with your hands. Side note: The quality of the battery matters, I bought several batteries over the time and its obvious that cheap batteries are lower quality of voltage. Last I did a test with several brands here in Denmark (I can only assume that this is the case other places). Good quality batteries like Duracell, Energizer etc. Have a higher voltage on the battery itself and lasts way longer than cheap batteries. This do matter. Some remotes has shown that even a 2.9V on a 3V battery is enough to make the car not respond to the command, mine measured 2.64V so i swapped mine (fresh Energizer measured 3.245V). A "fresh" Cheap brand battery will usually measure barely 3V. I have seen a cheap "fresh" battery measure down to 2.8V out of the package Where a good brand battery measures above 3V, seen some Duracell go 3.3V and last of ages. If that does not solve the issue, Then check fuses (refer to your user manual of your car), check fuses should be the first troubleshooting step in all troubleshooting, I am a bit odd so .. No fuses blown? if there are, replace it check again. At this point we know that central locking is working on the "hardware" side just not on the remote side and we have no fuses blown and a fresh HIGH QUALITY battery installed. Start by adapting one key, and work with that key. Adding keys later is the easy part. Car did respond back when i hit the key, but nothing happened at all..
To check if the car is receaving anything we will need to go read off what car in fact is getting. When you press a button channel 010 and 011 should change, with info what key is pressing what button and what function it has, if here nothing happens then you for sure have a dead key. To make sure that your key is in fact the right key you cannot know for sure but there are some indications that might help you out to see if the PCB in the key itself has been tampered with. When you look at this image you can see the two black dots, these are pins melted by the manufacture, if thees are broken then the PCB has been out and maybe tampered with. 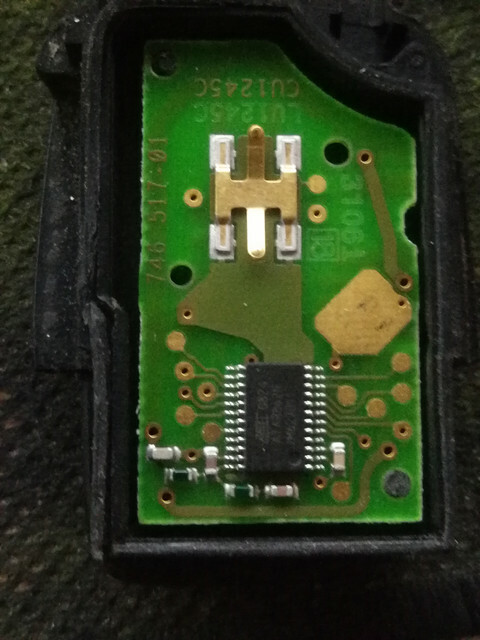 The key could have been tampered with since this PCB and the Immobilizer have nothing to do with each other, and therefore two different parts. I decided here to acquire a new key, since I personally don´t have $300+ to get a original one i went on my second best place eBay. 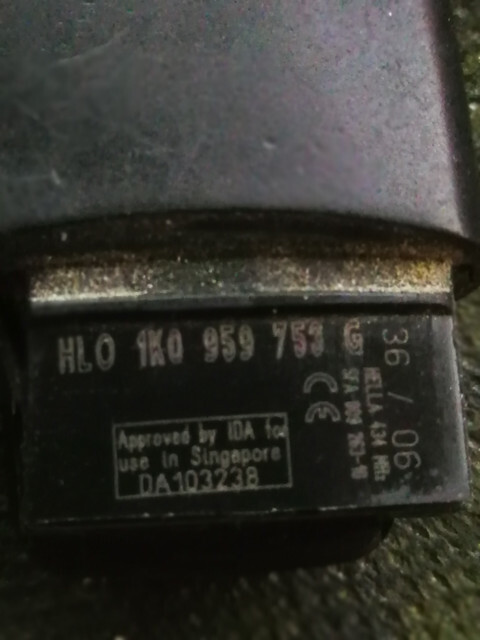 As you see It´s a HLO 1K0 959 754 G This is the part number, and this is the part you will be looking for. NOTE: In your right hand side, it states that it´s a HELLA transmitter @ 434 MHz (Megahertz). This is very important, since the car is listening to that frequency and only will respond to it. So a newer key with other PCB WILL NOT WORK! After some looking i have found this lad and got one home. Few days later it had arrived. Swapped the battery to a good brand battery, fired up my beloved VCDS did the steps above and BOOM! she works like a charm. since some of the melted plastic can remain. Once its tidy in there you will feel a little "click" when it jumps into place. Refit battery and away you go. Now my "Welcome Home" and "Here I am" (that´s what i call it, don´t know what its really named) also works, together with my other comfort stuff as mentioned above. Car has no clue what has changed so no one really cares.. Key looks original like it always did. This was my step-by-step headbanging-hair-pulling-solution to a quite irritating issue, feel free to comment and ask.. Moved to the How To's and Tips section of the forum. Edited title to add "(MK.5)" because that's the generation of cars the details are primarily applicable to.